I have been blissfully spacified since last Thursday. Today I came home and the blasted AIR CONDITIONING was on!!! Reason? The GG (who arrived home from Kneff Lake today, it’s near Grayling and there may have been a cougar there) was home and wanted me to “cool down”. Do I really need to remind him that I spent the day in an air-conditioned building and automotive vee-hickle? Me hot? Not. And it is not REALLY that hot outside. 89 degrees? Yeah, they’re telling us the heat index is closer to 100 but I don’t believe it. It’s too windy. Anyway, y’all know what’s just around the corner, roight? Here in the Great Lake State, we gotta soak up the heat while we can. The quarters in the first pic represent one of my most important tasks before we travel to the moomincabin for our big summer trip. I can get by without doing laundry for a week (although I do wash out underwear by hand if I need to (TMI?)) but two or three usually requires a trip or two to the laundromat. I have been wanting to install laundry facilities at the cabin for a few years now but we don’t quiiiiite have plumbing or lucky-shuckial facilities available, so I schlep everything into town to the wondrous Up North laundry instead. I don’t shovel much silver these days. I keep one dollar bills around for Farmer John or bus fare but when somebody gives me change, I don’t know what to do with it. Except for quarters! I save those for the laundromat. 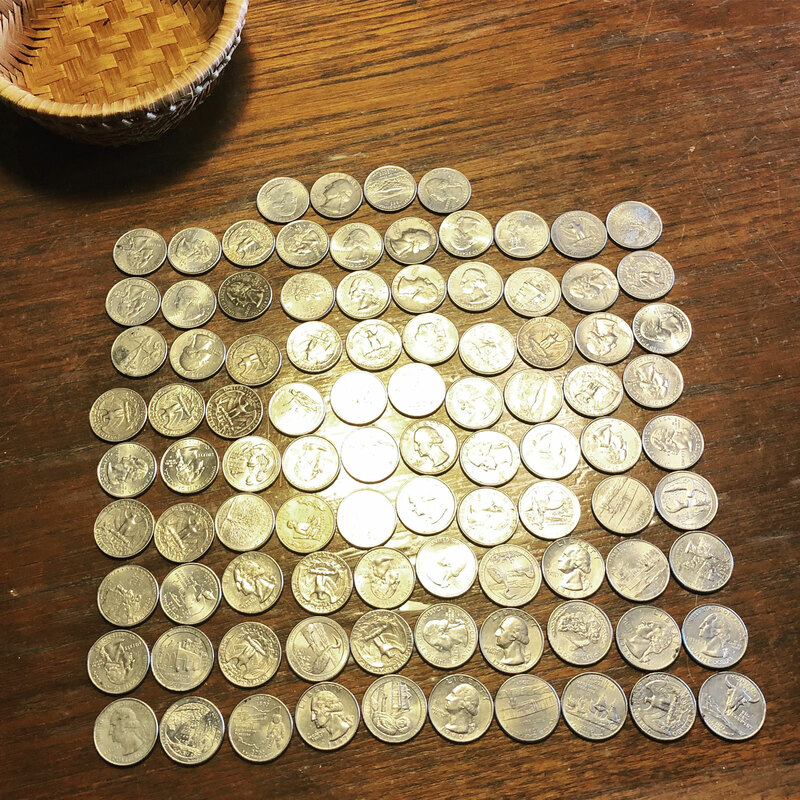 So, the Sunday before we last went north, I shoveled out the change basket (next to the key basket) and sorted everything out. Dimes, nickels, and pennies went to the Coinstar musheen at Meijer. Quarters went into a baggie for the Up North Laundry. The second pic is a blast from the past. For whatever reason, the Beach Urchins always usually liked to help with the laundry even though I made them get up ultra early for teenagers. So here are Mouse, Lizard, and Pengie. Back in those days, I used to fill up three triple-loaders plus a small musheen for grandma’s undies, etc. I think we were folding at this point in the pic. This was a different laundromat, good for a very long time and then not-so-good so I switched to the Lockview Up North. But I miss those days so much. I like the Up North laundromat. It was okay when it was the Lockview but I think the new owners do a better job. As much as I enjoy sorting out quarters and schlepping them around in a baggie, I yearn for a better payment system for the laundromat. I can pay for parking in Sault Ste. Siberia with an app, why not a laundromat? Or maybe just musheens that can read my debit card. I am sure that this technology exists in the world, just not at this laundromat. Don’t get me wrong, I am not dissing the laundromat at all. I am sure that it would be expensive to re-do their payment system, which might require them to replace their venerable old musheens. Cheers to finagling another week (or most of one) at the moomincabin to end the summer. No laundromat needed on our next trip. This entry was posted on Tuesday, August 28th, 2018 at 5:38 pm	and is filed under Uncategorized. You can follow any responses to this entry through the RSS 2.0 feed. Both comments and pings are currently closed. I’ve had a few nightmarish experiences at laundromats, so I’m not a fan. Glad you get to escape to the cabin. Cooler weather is on its way, here too. We’ve had quite a hot(and smoky) summer. What happened to our mild climate? Grrr. No AC need here now at Lake Gitchee Gomee. Looking at raindrops, light breeze moving over the water, lightning, small Cabin, Agatha Christie novel and the owners of Jack’s hoping that the winter stays freezing cold so that LPers don’t move to the UP and crowd out Jack’s. BTW, bicycle lane being added on the way to, and past, Jack’s.